Movie Review: If you’re looking for a comedy with attitude, “Grandma” is an option you should consider. Written, directed, and co-produced by Paul Weitz (“American Pie”, “About a Boy”), the film has the merit of putting a lot of soul, energy and charisma in every single scene, no matter if clichéd or not. 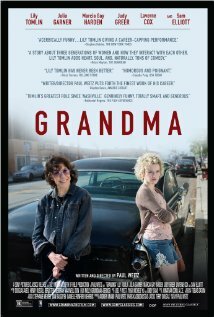 All those attributes come from the brilliant performance of Lily Tomlin, who generously plays Elle Reid, a conflicting, full-mouthed, feminist and lesbian poet whose angelical 18-year-old granddaughter, Sage (Julia Garner), asks for a little financial help when she finds out she’s pregnant. $600 would solve Sage's worries since she was already booked into a cheap but decent abortion clinic. This way, she wouldn’t have to tell the news to her scarily judgmental mother, Judy (Marcia Gay Harden), a strenuous successful businesswoman. Elle, who is still coping with the death of her longtime life partner and digesting the recent separation from a younger girlfriend, Olivia, cannot help with money since she’s broke, but that doesn’t mean she will abandon Sage to her fate. Driving a beautiful, but debilitated old Dodge, Elle and her granddaughter set off on a road trip, paying a few visits in order to borrow the required amount. The first attempt is Sage’s boyfriend, an indifferent and uneducated brat who learns a lesson from the fearless grandma. Then they meet with a tattoo artist who, unable to pay what she owes to Elle, makes her a nice tattoo on the arm instead. After a bad experience in a café that once was a costless abortion clinic, they rush into another café, where Olivia works, to try selling feminist books to the owner. The last option, and before resorting to Sage’s mother, is Elle’s former husband who’s still resentful about their turbulent past. “Grandma” would be a more serious case if the most evident clichés had been removed from its unbiased script. Still, it manages to keep one steady foot on dramatic and another on funniness, a feat achieved effortlessly due to the excellent Ms. Tomlin, who loudly screams for an Oscar in her first leading role in 27 years.